Grootvallier (also known as Grootvlei), an action during the Second South African War, fought on 1 August 1901 near the Vaal River in the north-west Orange Free State. 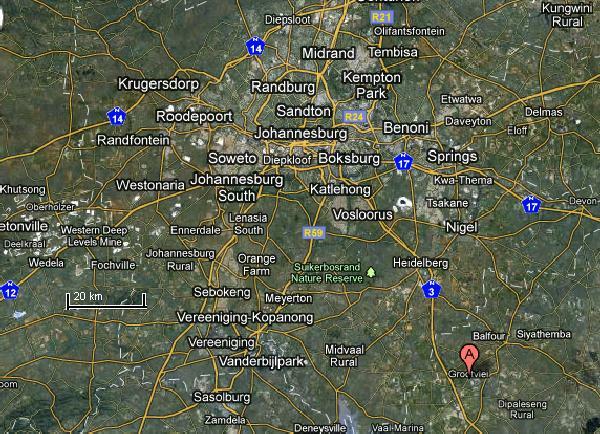 Location of Grootvlei (Red "A") on Google Earth. Grootvallier (also known as Grootvlei), an action during the Second South African War, fought on 1 August 1901 near the Vaal River in the north-west Orange Free State. A detachment from a British column commanded by Lieut.-Colonel H.B. De Lisle, comprising 200 South Australians led by a British officer, Major J.S.M. Shea, succeeded in locating a night laager (camp) being used by a Boer commando on a farm. Unknown to the British, this camp actually contained the noted enemy general, J.C. Smuts, who was resting while attempting to evade an extensive drive which the British commander-in-chief, General Lord Kitchener, had launched on 29 July. After a silent approach and stealthy reconnaissance, the Australians prepared to assault the enemy position after dark. When they attempted to gallop in on the laager from three sides, however, they met an unexpected obstacle in the form of wire fences and were forced to dismount and rush forward on foot `with bayonets fixed'. This delay enabled nearly all of the camp's 300 occupants (including Smuts) to escape. Nonetheless six Boers were killed in the hand-to-hand fighting which raged at the farmhouse, and twelve prisoners (including two officers) were captured along with a large number of horses. The Australians' losses were just two men wounded, though Shea's Indian orderly was killed while riding behind him. The incident was significant enough that several participants were mentioned in Kitchener's despatches and one man was awarded the Distinguished Conduct Medal. L.M. Field (1979) The Forgotten War, Carlton, Vic. : Melbourne University Press. 495 Trooper Thomas KERMODE, 5th South Australian Imperial Bushmen, slightly wounded. 646 Trooper James Campbell WHITTINGTON, 5th South Australian Imperial Bushmen, severely wounded. Major John Stuart Mackenzie SHEA, of the 15th Bengal Lancers, for leading 200 South Australians in a night attack on Commandant Smuts's laager on the 1st August and scattering 300 Boers after hard fighting. Trooper Phillis BRANDT, of the 6th South Australian Imperial Bushmen, for conspicuous gallantry at Grootvlei. Trooper Thomas KERMODE of the 5th South Australian Imperial Bushmen, for conspicuous gallantry at Grootvlei. Lieutenant Sydney Colin MACFARLANE, of the 6th South Australian Imperial Bushmen, for exhibiting conspicuous gallantry and fearless leading of their men. Captain John Alexander WATT of the 5th South Australian Imperial Bushmen, for exhibiting conspicuous gallantry and fearless leading of their men.